Marcy Cruz wanted to see more size diversity in plus size fashion, so she created the Size 22+ lookbook, showing the range and style of plus size women! As the year 2016 comes to a close, body positivity has continued to make major strides in gaining more visibility in the mainstream, but this growth in exposure has come with a serious void for women above a size 22+; in fact, they’re still virtually invisible from the movement they helped shape and create. News articles hail size 10 models as body positive pioneers and icons while those same women share their disdain for being labeled plus size. Mainstream body positivity has become a watered-down and more palatable version of fat acceptance and that all comes with a high cost to those visibly fat women who stand to benefit most from the stigma body positivity is supposed to be challenging. One blogger, Marcy Cruz of Fearlessly Just Me, decided that if mainstream fashion wasn’t going to fill that void then she was going to do it herself. Cruz has been blogging since the year 2000 but as a size 26/28, she admits there’s still very few opportunities for someone her size. Cruz says she noticed that even brands who carry extended plus sizes (clothing above a size 24) were still using models on the small side of plus to sell these garments. And as someone who believes firmly in creating your own opportunities she says she saw herself as having two options: complain or take action. She chose the latter and created a digital Fall lookbook featuring bloggers who were all a size 22+. From New Zealand and Canada to across the United States, this blogger shows that style has no size. “I wanted to create a way for bloggers a size 22+ to have their own spotlight and defy those stereotypes that society has imposed on us; we’re taught that hourglass figures or pear shape figures where women have a small waist and no lumps or rolls, are ‘safe’ to show as plus size bodies. But that is not the norm,” says Cruz. When Cruz thought about who she wanted to ask to participate in the lookbook, she had a few favorite fellow bloggers in mind. She says she thought it might be a challenge to find a big list since most plus size bloggers are between sizes 14 and 18 but she ended up being totally wrong about that. Though 12 bloggers were ultimately included in the lookbook, she had a list of 25 and she ended up picking women that represented differences in style, size, shape and location. The 12 bloggers include: ShaKera of The Real Sample Size, Amanda of Bella Moxie, Lisa of Mustangsallytwo, Corissa of Fat Girl Flow, Emily of Authentically Emmie, Meagan of This Is Meagan Kerr, Meshel of The Muffin Queen’s Closet, Amanda of Fashion, Love & Martini’s, Rebecca of The Plus Side of Me, Ashley of My Simply Curvy Life, Amanda of the Koker Chronicles and Marcy herself. The bloggers also each share their favorite brands to wear which include retailers such as Society+, Melissa McCarthy Seven7 and SWAK among others. One of the brands named by almost every blogger was ELOQUII and Cruz credits their size 26/28 lookbooks for that. It’s a challenge for size 22+ women to know how garments are going to fit if they are only shown on size 10 models. Cruz knows from experience how much of an impact this visibility can make because in addition to blogging, Cruz works as a First Fit Reviewer for Gwynnie Bee where she shows how garments fit on her frame. The feedback she has received from this has been overwhelmingly positive. And while mainstream body positivity has helped make certain bodies more accepted, the stigma against size 22+ bodies persists because of a lack of visibility, access and praise for varying shapes and sizes. Cruz’s lookbook works to change that. Want to see the full lookbook? 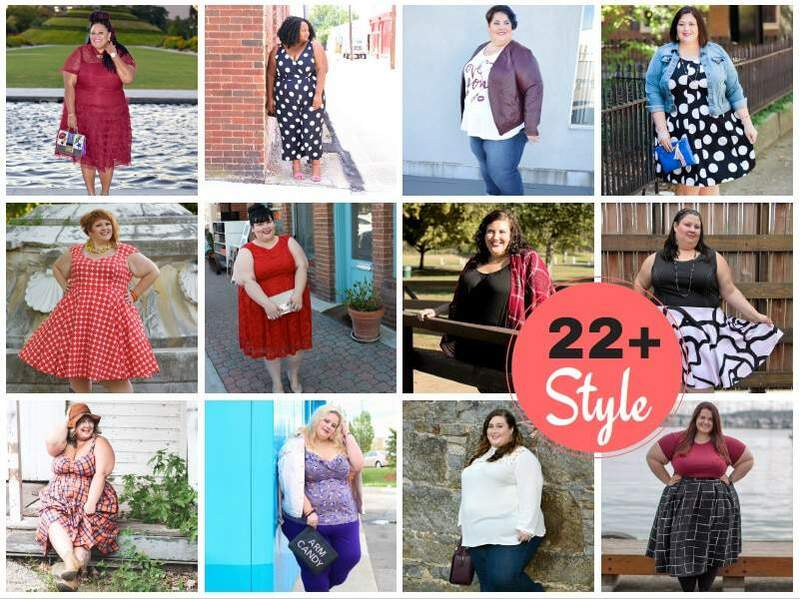 Check out the Size 22+ Lookbook here! Want to Get Involved? See More Fashion Options? Join in on the Fun? With the initial success of the lookbook, Cruz has plans to launch another one in a few months. She encourages bloggers to share their images with the tag #stylebeyond22 and follow the page at @stylebeyond22 to get involved! Cool News! ASOS Launches the Plus Size Men Collection! Alysse Dalessandro is a plus size fashion blogger, writer, social influencer, designer, and professional speaker. After graduating with a double-major in Journalism and Gender Studies from Loyola University Chicago, this entrepreneur is best known as the owner/designer for body positive fashion brand and personal style blog Ready to Stare. Her brand has become a haven for those whom fashion has otherwise ignored. It's a space where individual style is celebrated and breaking the rules is encouraged. Alysse has been featured on Good Morning America, Buzzfeed, The Huffington Post and more. She recently walked in dapperQ's fourth annual queer fashion show during New York Fashion Week.